What was your score the first time you played? My first score was 3.44, I think. Good suggestions on the upgrades. I didn’t have too much accuracy with my trackpad. My first score was 2.76 with a ThinkPad trackpoint. I tried it a second time and got 1.76, again with a trackpoint. 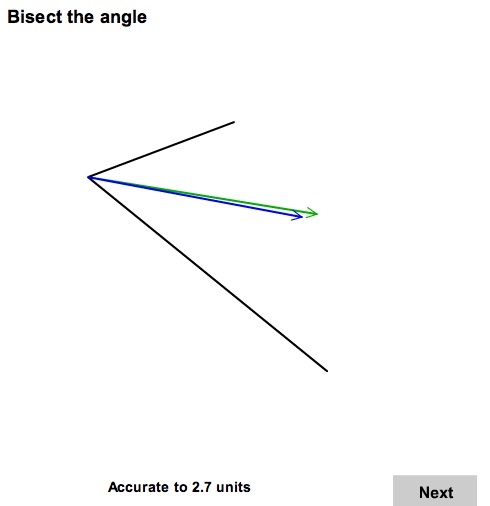 Certainly, taking more time will produce better scores – especially in situations where you have to estimate multiple distances or angles, like in the triangle center and convergence tests. I think someone had a link in their status message, perhaps. That’s pretty cool about flatbed scanner camera. Yeah, I guess this stuff is a few years old, but I found a few pages on using entire flatbed scanners or only their imaging elements in view cameras, panoramic cameras and slit-scan cameras. All of these things have given me plenty to think about.